The summer months are perfect for grilling, so this is an awesome recipe that’s not only healthy, but also simple to make and features flavorful Gulf Coast Shrimp! size possible, preferably jumbo or colossal. One pound of jumbo size will yield 12 to 15 shrimp, or 10 colossal. 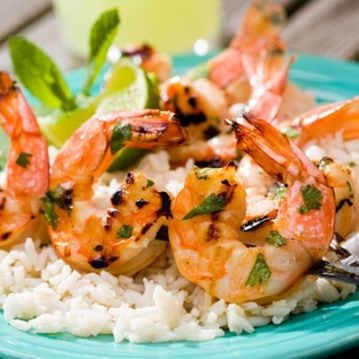 Smaller shrimp are prone to falling through the grill rack. Clean them up – Many recipes recommend that you devein the shrimp. varieties, deveining large shrimp will help Though it is not as important with smaller avoid getting a gritty bite. Arrange shrimp evenly on 4 metal skewers. Spray grill rack with nonstick cooking spray. Place skewers on rack. Grill, with grill lid down, over mediumhot (350 to 400 degrees) coals for 3 minutes per side or until shrimp turns pink. Serve over cooked rice.